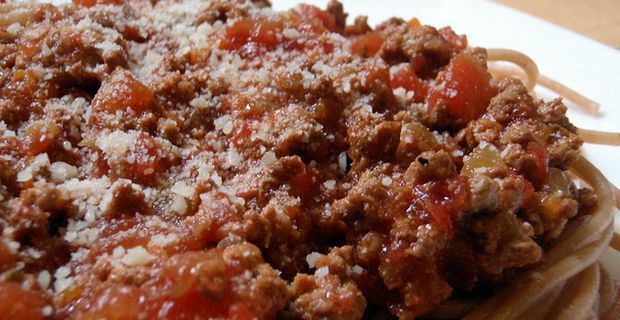 Bolognese has become one of those foreign dishes that the British have adopted as their own. Everybody has their own "spag bol" recipe, which can involve throwing in everything from mushrooms to tuna. Occasionally though it’s worth going back to the authentic recipe, to reconnect with the original appeal of this rich Italian ragu. Meanwhile, back in Bologna . . . The city of Bologna prides itself on its gastronomic excellence. The locals would frown on anybody who tried to tamper with the dish that carries their city’s name and exemplifies the region’s fondness for rich, meaty sauces. Authentic bolognese, at least according to local culinary authorities, is made with lean minced beef mixed with a little finely chopped pancetta. Chicken livers are not included. The pancetta is browned with finely diced onion, carrot and celery until the vegetables are soft, at which point the beef is added. The sauce takes its colour from tomato puree or reduced passata. Add a half glass of red or white wine and a little milk to make the sauce velvety and rich. Purists allow salt and pepper but don’t include herbs, although a pinch of oregano, dried basil or thyme would not be too heretical. The secret is to cook the ragu very slowly on a low heat for two to three hours at least. The Italians serve it with fettucine or tagliatelli but denying the British their spaghetti might be taking authenticity too far. Don’t be deceived by our photo by the way. There is too much sauce on that pasta. The bolognese should complement the spaghetti not bury it.